One of my most favorite condiments is Buffalo wing sauce which is made all the more strange due to the fact that me and chicken wings have never been able to be friends. I wish I could enjoy wings. I always think I want a wing. I whet my palate with a celery stick and mentally prepare by ordering a cold beer but then when the time comes I always feel like, okay, so that was a lot of work for what? A bone covered in sauce? Maybe I am doing something wrong but I’d bet that a roll of pennies weighs more than the meat on a dozen chicken wings. Don’t get me wrong, I absolutely respect the glory of the wing but I also want to make everyone happy so I will just leave the serious wing-eating to those who get it. My only request: let me keep my Buffalo sauce and no one gets hurt. It just so happens that The Day Of Snacks And Chicken Wings (known colloquially as The Super Bowl) is quickly approaching. Last year I made pretz-ales which is just a jazzy name for soft pretzels made with beer and definitely hit the mark for some serious snack-age. But this year I thought it would be fitting to honor the other half of the classic holiday du sport: Buffalo wing sauce. 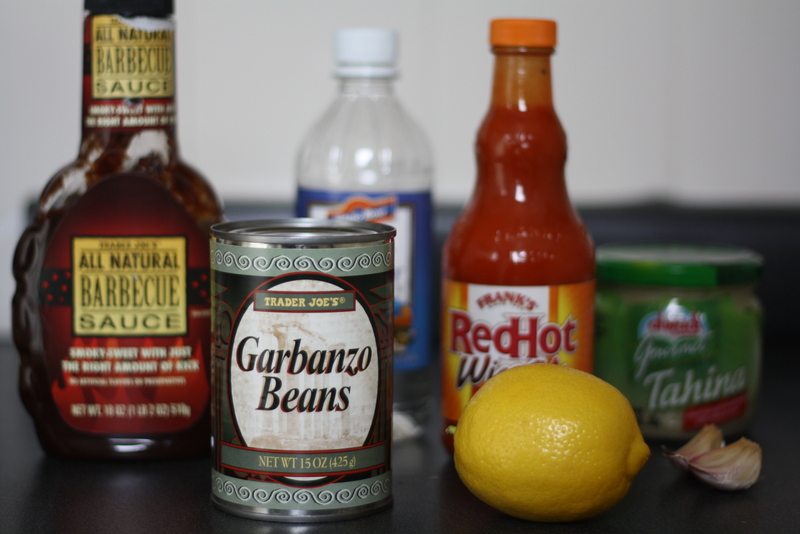 I was curious about the history of this sauce so I hopped on a little thing called the World Wide Web and found out some facts. First: the sauce is named for Buffalo, as in the city in upstate New York and not buffalo, as in the animal that enjoys roaming around homes somewhere in Kansas. Second: there is not just one confirmed tale about how the chicken wing came to be a sensation. Wikipedia (where else would I get my information on hot sauce/other stuff that falls into this general random category?) lists SIX stories about who came up with the sports bar snack. I mean come on, six stories means that no one knows anything and everyone should just throw in an hypothesis or three on how the chicken wing came to be. Is anyone reading from this Buffalo, New York and have any secret information they would be willing to share? I should say what we do know is that Buffalo sauce tastes amazing and should be used in more things, especially if those things happen to be hummus. Hummus is an beautiful thang. Not only is it an excellent vehicle for Buffalo wing sauce but a can of chickpeas costs less than a dollar. 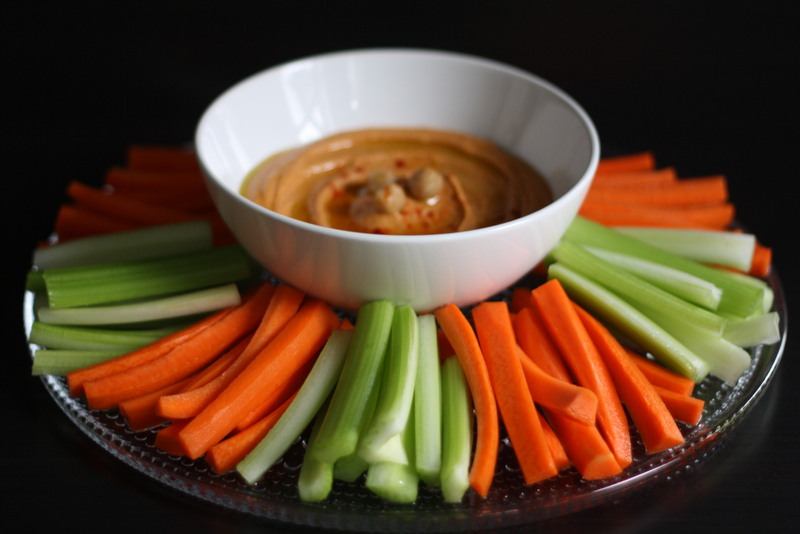 Bonus: chickpeas are good for you which means this is a healthy Super Bowl snack! I know! Healthy? Super Bowl? Those things don’t normally go together so I won’t be offended if you need to pretend that this is a deep fried nacho recipe. While I love drinking beer and snacking, you may also know that I have about as much interest in sports as McKayla Maroney had with the Olympics this summer. But when the Seahawks made it to the playoffs this year I jumped on the 12th MAN bandwagon, mostly to have an excuse to consume chicken tenders on Sunday afternoons and to support my hometown of Seattle. I even bought a t-shirt (on super-extra-bonus-50%-off-final sale) which everyone knows is really all it takes to make fandom official. So when kickoff goes down on Sunday I may not have that much invested but you can count me in for wearing my t-shirt and rooting for sports, er, I mean GO SNACKS! Set aside a few chickpeas as a garnish. In a food processor puree all the ingredients together – except for the reserved liquid – until smooth. With the machine running, drizzle in about half of the liquid and process until incorporated. 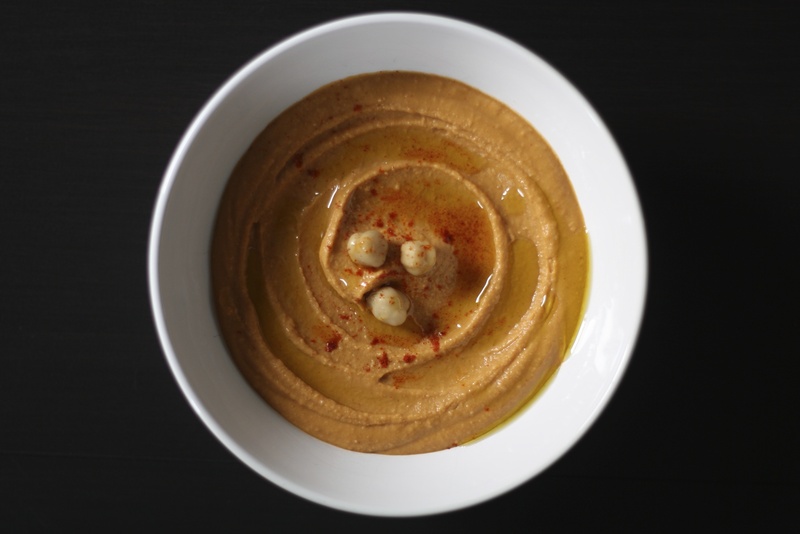 Keep adding liquid, a teaspoon at a time, until you reach your desired consistency of hummus. Taste and adjust seasonings. 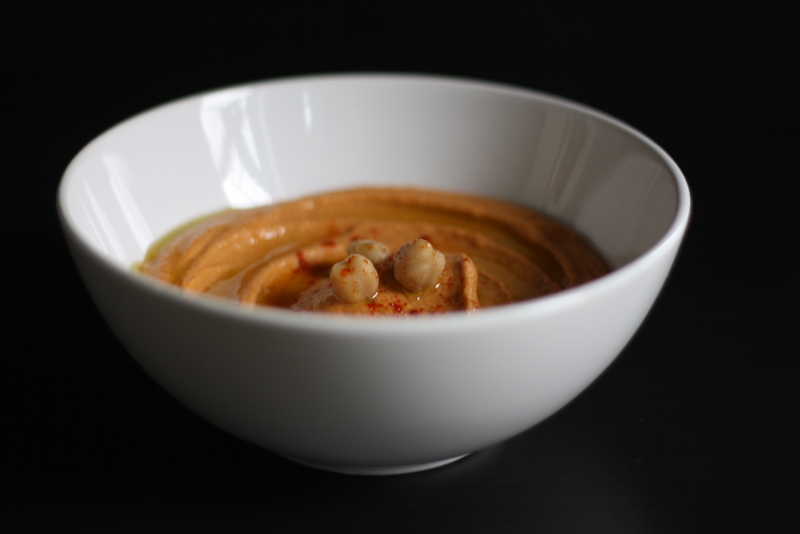 Transfer to a bowl and drizzle with olive oil, a pinch of paprika, and the whole chickpeas that you set aside earlier. 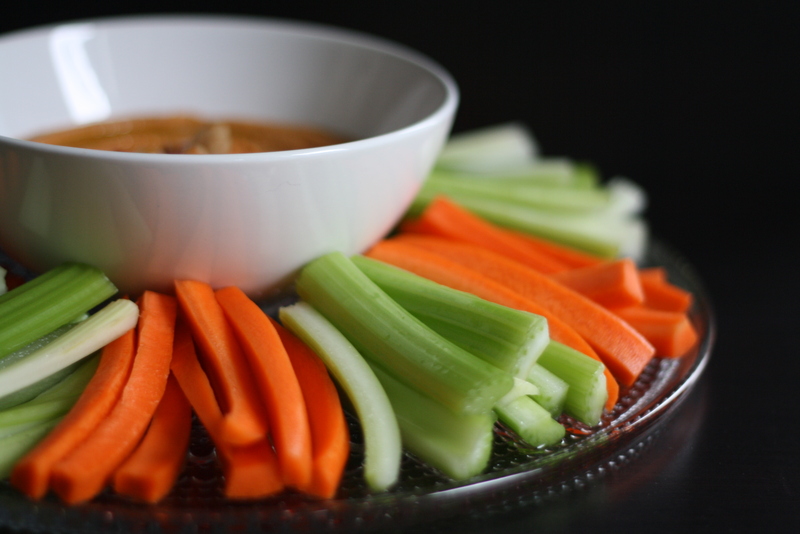 Suggestions for serving include: carrot sticks, celery sticks, pita bread triangles, pretzels, crackers, or whatever else you have within your snack reach. Oh man this looks really exciting. The bf loves loves loves both wings and hummus – he’ll be excited to try a combo. 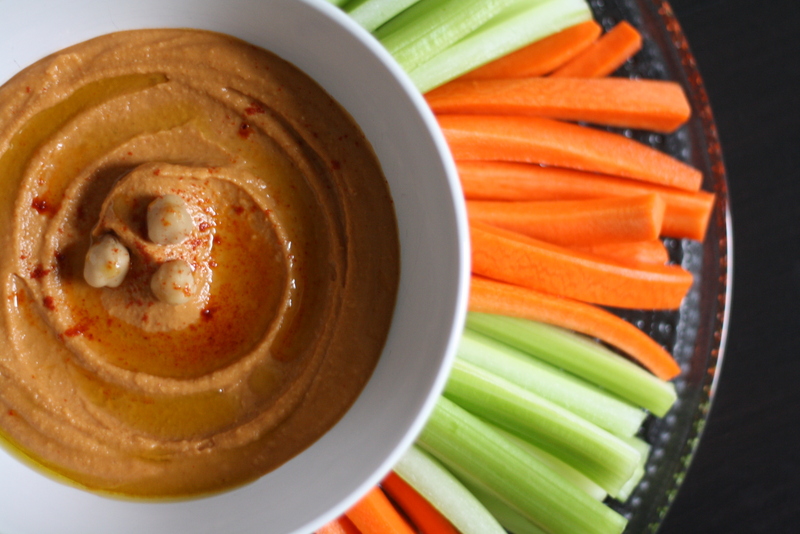 Well, I have no interest in the Super Bowl, but I definitely have an interest in spicy hummus! This sounds really great–especially with celery. I’ve no interest in the SB either, but ya gotta love some Franks Red Hot! I think the real credit for Buffalo Wings goes to the Anchor Bar in Buffalo, NY. I have friends who have made a weekend pilgrimage(s) to the Anchor for those original wings. I am a Buffalonian born and raised (and I still live here) and Greg is correct. The Anchor Bar gets credit for the invention of wings. And, I lived and worked in Buffalo in the 60′s and worked at the Anchor Bar which was definitely the home of Buffalo Wings. If you ordered them extra hot they were simply fried and then tossed in pure Tobasco Sauce with a dab of butter. Um, um, good. Dip is where it’s at. If I can eat it on a carrot stick – I’m there. I am also from and currently reside in a small town outside of Buffalo, NY. This looks amazing and would surely calm the wing craving in me without all the calories and grease for sure! My family is scared of hummus, which makes me super duper sad. I bet if I made it this way, they would be a little more willing to try it! This looks really interesting, maybe it’ll get me to like hummus! I’ll have to try this out.